(Singing) It's the most wonderful time of the week... no, not bedtime - it's fall-to layout challenge time! 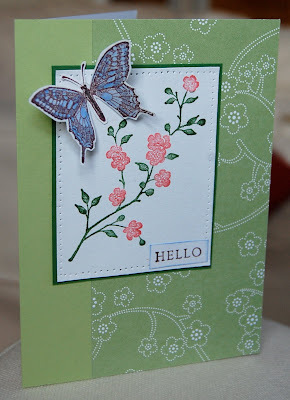 Those brilliant ladies over at Clean and Simple Stamping have come up with another gorgeous sketch to inspire us. Here's my take on it. I love how the butterfly turned out. I stamped it on Whisper White with Chocolate Chip ink, coloured it using Bashful Blue and Ballet Blue and my trusty blender pen, then cut it out carefully with my sharp scissors. Here's a close-up. The blender pens give it a lovely iridescent quality. I often stamp things I'm going to colour with Choc Chip ink because it doesn't smudge like black does. Yes I know that Stazon doesn't smudge but I don't like the smell! It seems a long time since I saw a butterfly but the daffodils and crocuses in my garden are pushing their way up, undeterred by the cold. There's been a snowdrop standing there with its hands on its hips for some time now and next to it a very confused clump of primroses. They are a sign that miracles happen. Miracles may be happening in the garden but I don't think my house is going to clear itself up. It's on with the pinny for me! you're ready for spring :) beautiful card! TFS! Very pretty. I like the position of your butterfly. beautifully done!!! I loveeee the CAS blog!